BARRANQUILLA, Colombia — Nesta Carter and Jonielle Smith swept the men’s and women’s 100m for Jamaica on Day 2 at the 2018 Central American and Caribbean Games in Barranquilla on Monday. Carter, who broke 10-seconds with the support of a slight tailwind on Sunday, returned a day later to post a season’s best time of 10.07 seconds to secure the gold medal in the men’s race. “I feel good coming out here – it’s not the best conditions here in Colombia but we are making the best of it – running a season’s best, I am very pleased with it,” Carter said. 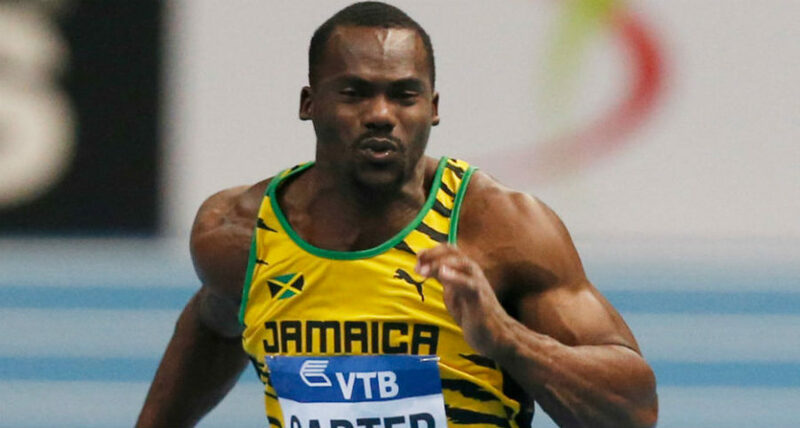 Carter, who won a gold medal at the 2012 Olympic Games in the 4x100m, is the sixth fastest man all-time with a personal best of 9.78 from 2010. Jason Rogers of St. Kitts and Nevis bagged the silver medal in 10.15 seconds, while Cejhae Greene of Antigua & Barbuda, who set a new Central American and Caribbean Games record of 10.00 seconds in the semi-finals, grabbed the bronze in 10.16. Mario Burke of Barbados was just behind in fourth in 10.17. In the meantime, Jonielle Smith of Jamaica secured the gold medal in the women’s 100m with a wind-aided time of 11.04 seconds (+2.3 m/s). “I feel awesome! I don’t feel I could have executed a better race,” Smith said after the win. Trinidad and Tobago’s Khalifa St. Fort followed Smith home in 11.15, beating Venezuelan Andrea Purica finished third in 11.32. In another medal events on Monday’s Day 2, Jamaica captured another gold medal when 2015 World Championships bronze medalist O’Dayne Richards set a new CAC Games record of 21.02m to win the men’s Shot Put. National runnerup Ashinia Miller made it a 1-2 finish for Jamaica after he threw 20.19m for the silver medal to edge British Virgin Islands’ Eldred Henry, who collected the bronze with personal best mark of 20.18m. Elsewhere, Colombia’s Olympic Games triple jump champion Caterine Ibargüen won the women’s long jump with a mark of 6.83m (+2.9 m/s), Rose Mary Almanza of Cuba won the women’s 800m in 2:01.63, while the men’s two-lap event went to Mexico’s Jesús Tonatiu López in 1:45.2.